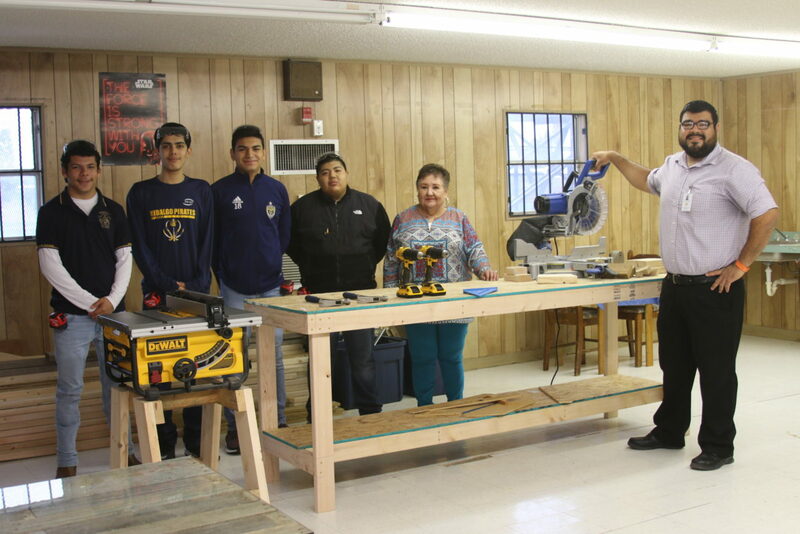 Hidalgo Early College High School Special Education Department started a wood craft shop called The Pirates Plank. This shop was incorporated into the Learning in Vocational Environment (L.I.V.E) Program which is designed to teach work skills to students with special needs and to support their growth into adulthood. The Pirates Plank is where students will learn the basics to building small furniture and other items. Janie Salazar, the head of the SPED department, said her students were interested in these types of skills. “My students have been asking for the opportunity to learn building trade skills. This will give them knowledge on how they could work with their hands,” Salazar said, adding that the class can help teach students a trade that could be useful in their future. Edilson Ramirez, a junior, enjoys being involved and learning a trade. “This is something I like to do, and I want to learn the trade so one day I can open my own shop and build things for other people,” Ramirez said. Ramirez was the first student to participate in the Pirates Plank class. Ramirez hopes this class can be incorporated into his daily class schedule to further improve his skills. Andrew Hinojosa, also a junior, said this trade could be helpful to his family. “I’m happy to be taking this class, I’ve wanted something like this for myself for my future and family,” said Hinojosa, adding that he can be used as a fixer upper around his family home with his new skills. Pirates Plank received donated pallets from Ace Freight in McAllen, and $300 worth of supplies from Home Depot. Pirates Plank has already completed two work tables, a desk and a picnic table and is working on a three-seat bench. A future project also includes a green house, where students will be able to grow vegetables. Salazar plans on making these items available for sale for Hidalgo ISD schools and staff.